RALEIGH, N.C., Nov 06, 2018 (SEND2PRESS NEWSWIRE) -- RALEIGH, N.C., Nov. 6, 2018 (SEND2PRESS NEWSWIRE) -- Auto dealer marketing firm, Sokal Media Group, signs as agency of record for Freehold Nissan. By mid-November 2018, Sokal Media Group will begin launching new websites for the store, create new advertising campaigns including digital and traditional ads, and assist in many other areas of dealership business. "Our dealership has won some prestigious awards recently and as we move in this positive direction, we are excited to partner with Sokal and his team," said Craig Millinser, general manager of Freehold Nissan. "Our goal is excellence in service and product and I believe we'll get that message out in new and creative ways." Freehold Nissan is located on Route 9 North in Freehold, New Jersey. They boast a variety of new and pre-owned quality vehicles that can be seen in their showroom or conveniently viewed on their website. 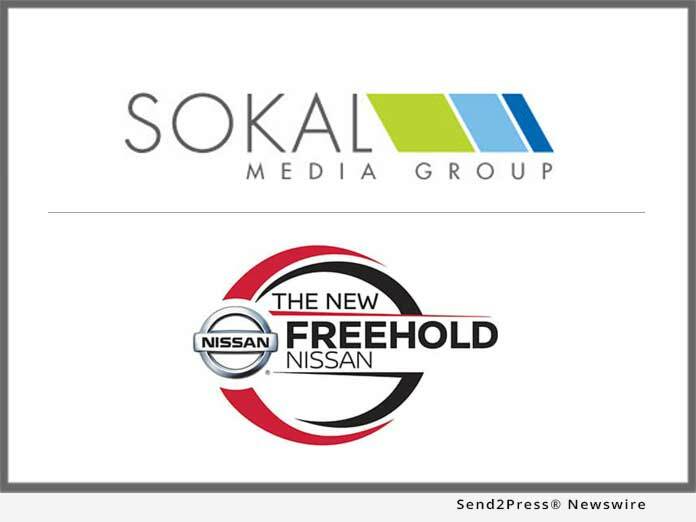 "Having lived in Freehold myself for many years, I am proud to be a part of Freehold Nissan's growth," said Mark Sokal, CEO of Sokal Media Group. "We'll have all hands on deck, creating a high standard of advertising for them." With headquarters in Raleigh, NC and offices stretching from up and down the east coast to Texas, Sokal Media Group is the area's largest advertising agency focusing on automotive advertising. Sokal Media Group is dedicated to growing business for their clientele through multiple marketing and advertising services. As a full-service agency, they manage the entire project from start to finish. The company executes everything from media buying, radio and television production, ad design, direct mail, search engine marketing, website design, website maintenance, and much more. Sokal Media Group employees over 102 staff members from Account Executives and Account Coordinators, to Media Buyers, Digital Strategists, Website Developers, and Graphic Designers. Currently, Sokal Media Group manages 529 clients across the country.